The Christian concept of stewardship helps describe the role of parents. They raise children, not own them. Parents share responsibility; they are not the only stewards of their children. Parents model values with their behaviour. They don’t only teach with words. Her holistic view takes into account both sexual health and reproduction, sensuality, intimacy, sexual identity and sexualization (the use of sexuality to control or influence). From LBGT issues, teen pregnancy, sexual abuse and violence, prevention and birth control, pleasure and fun for both parents and children. Openness and honesty rule without exceptions or hidden secrets. 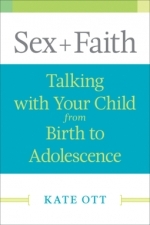 Each chapter explains biological, psychological, developmental issues relevant to each age group. It has Q&A sections for both children and parents, provides relevant Biblical references to enable discussions. Educational issues to keep in mind as parents (you’re adult, they’re not yet) and lists of additional resources (books, web sites) completes this reference guide many contemporary parents has wished their own parents would have used decades ago. Kate Ott spends most of her time as an author, professor and parent. As an author, she blogs, designs curriculum for churches, and writes academic publications including articles, book chapters, and books. In order to pay bills, she works as an Assistant Professor of Christian Ethics at Drew University Theological School. The Theo School is a progressive United Methodist Seminary nestled in a forest in Madison, NJ. Her role as a parent reaches far and wide. she could add one more “p” – partner. With her husband she parents two children. Netgalley provided me a free review copy to read the book and share my honest opinion with you. Book Review – Is Sexual Unhappiness a Religiously Transmitted Disease? Helpt Dokter Corrie bij het bespreekbaar maken van seksualiteit met 10-12 jarigen?